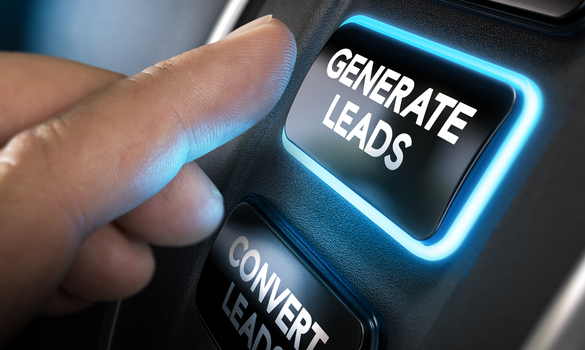 The lead selling industry is expanding due to companies’ high demand for good leads. As a new lead seller, you need to learn how to compete with your sales savvy competitors in order to make a living. Your main priority is to generate leads for a variety of businesses. Sprinkler repair businesses and large, restaurant franchises all need leads. These companies that need already-generated leads either do not know how to generate them themselves or do not have the time to. Some of these companies are willing to pay lead sellers big bucks for their work if it is done well. Continue reading to discover how to profit off of selling leads to businesses. To begin selling leads to businesses, decide on a focus industry. While expanding your horizons can be beneficial in the future, new lead sellers should always start with one target industry as customers. Service providers are popular customers for lead selling. Other common customers include professionals in insurance, home improvement companies and law firms. You might be surprised at how many lawn care companies could use generated leads to improve business. Choose an industry that interests you. After all, you will be spending a lot of time researching the market. Lead sellers who make an industry of interest their target audience succeed more than others because they are more motivated to find the best leads. Thus, they receive more business and make higher profits. Another necessary step to take to start selling leads to businesses is to understand the different types of leads. The two types of leads include immediate prospects and mailing list leads. You can identify immediate prospects by collecting contact data from consumers who search for related products. If a consumer searches for new bathtubs and tiling services, home improvement businesses can target them. Thus, you can sell home improvement businesses the lead and make a profit. Mailing list leads depend on demographics, making them great to sell to local businesses to profit. In order to make money selling leads, you need to be able to identify sales signals trends. It is difficult for lead sellers to determine which signal trends will result in the best lead generation. More so, it is difficult to prove to buyers that you have discovered the top trends to use. To find the best trends and obtain data that proves their success, you need to think like a marketer. Marketing professionals use social media platforms and digital footprint data to determine the best signal trends. During the process, many marketers even get more twitter followers and add to their Facebook friends list. With more social media connections, you can easily keep yourself up-to-date on new trends. Use these tools to find trends and then use competing companies’ results as proof of success. Then, you will be able to convince buyers to purchase your leads. Many lead sellers obtain great leads that sell well through lead generation forms. If you plan on starting your own business selling leads, develop a website and include a lead generation form on your home page. If your target audience is real estate agents, offer potential home buyers a list of local real estate agents for free. Instruct them to provide their contact information in exchange for the free list. You will have a long list of leads to sell to real estate agents in no time. Since this tactic saves you time, you can make more money fast. In addition, find somewhere to sell your leads in order to profit off of them. Not all lead sellers wish to run their own website for lead selling. Luckily, there are many websites that allow selling leads online. However, in order to maintain a good cash flow, you need to find the best lead selling site. Look for one that partners with top lead buyers all over the world. That way, you will enter the lead selling business with an established network of potential buyers. Therefore, you will be able to sell leads efficiently from the beginning of your career. Since all kinds of businesses need good leads, lead sellers have tons of opportunities to profit. To do so, first decide on a target industry for your customer base. Then, learn about the two types of leads: immediate prospects and mailing lists. Think like a marketer to identify the top sales signal trends. Implement lead generation forms into your websites to gain leads quickly. Finally, find a website that partners with buyers to sell your leads on. Follow these steps to profit off of selling leads to businesses.